1. Stainless steel round tube polishing machine round pipe is suitable for polishing all kinds of metal surface on circular section. The whole machine consists of four parts: polishing machine, feeding device, discharging device and control system. The round tube polishing machine can be divided into basic polishing machine and high matching polishing machine according to the range of throwing pipe. According to the number of polishing heads, they are divided into 6 heads, 8 heads, 10 heads and 12 polishing machines. After polishing, the surface roughness can reach 500#-700#. 2. The automatic production process includes automatic feeding, automatic polishing (1000 impellers, linen wheels, cloth wheels, wind cloth wheels) and polishing wax. The round tube is suitable for polishing all kinds of metal surfaces on circular section. The whole machine consists of four parts: polishing machine, feeding device, discharging device and control system. The round tube polishing machine can be divided into basic polishing machine and high matching polishing machine according to the range of throwing pipe. 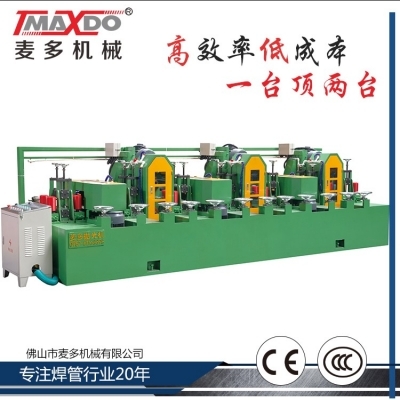 According to the number of polishing heads, they are divided into 6 heads, 8 heads, 10 heads and 12 polishing machines. After polishing, the surface roughness can reach 500#-700#. It is produced by automatic feeding, automatic polishing (1000 impellers, hemp wheel, cloth wheel, wind cloth wheel) plus polishing wax, feeding and other processes. Because the polishing technology of stainless steel polishing machine is mature, it has been widely applied in the pipe polishing industry. (one is: saving time / simple technology, two are: good quality / high brightness, three: less pollution.) Easy to operate, high quality, reasonable price, in line with the quality requirements of domestic and foreign markets, to make high-quality, high brightness tube.